Maine is under assault by the European green crab, an invasive species that feeds on clam beds and has been linked to the decline of the soft-shell clam industry. And with climate change a daily threat, populations of the crabs continue to rise in Maine and New England. In fact, the value of last year’s harvest soft-shell clams — which Maine produces more than any other state — dipped nearly $4 million, the lowest harvest of soft-shell clams in Maine in decades, largely attributed to green crabs. While much research has focused on the potential impact of the green crab invasion, research done at the University of Southern Maine (USM) is focusing its efforts on eradicating the species before it’s too late. In an exclusive partnership with Manomet, an environmental research organization, USM students are working on this crisis exploring the connections between marine biology, industry and aquaculture. Erica Ferelli, a recent graduate of USM and intern at Manomet, is working with fellow alumnus Marissa McMahan, senior fisheries specialist at Manomet, to spearhead the development of a commercial green crab fishery in Maine. 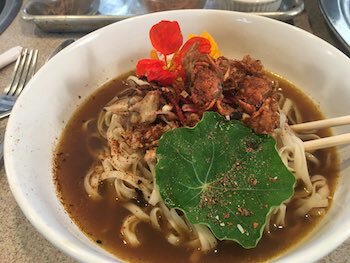 The goal: save one industry and bolster another by removing the invasive species from the environment while developing a culinary market for them. It’s just one example of many ways USM is working with community and corporate partners to get students out of the classroom and into their fields of interest while solving real-world problems close to home. So lucrative are green crabs, McMahan told NECN, NewsCenter Maine and NBC Boston on Wednesday, some Maine fishermen have sold them to local restaurants for $3 for each small crab or about $20 per pound. In Brunswick — where Manomet has a satellite office — Brunswick Inn Executive Chef Ali Waks has been experimenting with green crabs. She’s made green crab dip, bouillabaisse, broth and even tempura green crabs. "There's so much flavor there," Waks told reporter Danielle Waugh. 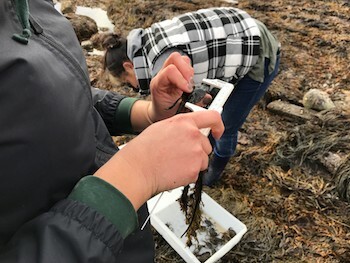 Erica Ferelli’s ongoing experience began last fall when, in class with Assistant Professor of Biology Rachel Lasley-Rasher, she and her classmates ventured to Kettle Cove in Cape Elizabeth to examine and measure the crabs which, when their shells are soft, are harvested. In her ongoing internship, Ferrelli is analyzing data and monitoring green crab populations. This summer she has worked alongside McMahan gaining valuable, hands-on experience with field science, marketing and industry. She said that hands-on experience primed her for a career after graduation. Lasley-Rasher said it’s a goal of hers to get students out of the classroom and into the field, in order to address real-world problems. That hands-on work, she said, is what separates USM students apart from the rest when it comes to starting their careers. Those who have had prior experience in the field, McMahan said, are ideal candidates.